The existence of Blake’s Sun Dial has been known since the publication of Butlin’s great catalogue,2↤ 2. 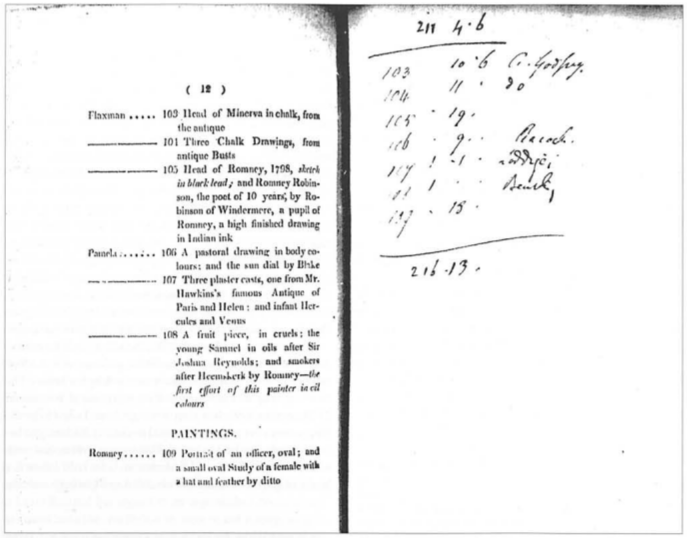 The Paintings and Drawings of William Blake, 2 vols. (New Haven: Yale University Press, 1981) #374A, conjecturally dated 1800-03. but the identity of “Pamela” has not been established, nor the means by which Hayley acquired Pamela’s “pastoral drawing.” These subjects can now be clarified, although Blake’s Sun Dial remains untraced. Hayley first met Pamela, then aged fourteen, when visiting Paris with Romney (both sympathizers with the young revolution) in 1790. There they were entertained by the celebrated writer on education, Madame de Genlis, who was also governess and tutor to the children of the duc d’Orléans. It was given out that Pamela, so called after Samuel Richardson’s heroine, had been born in Newfoundland, that her name had been Nancy Sims, that she had been taken by her mother back to Hampshire after her father’s death, and then had been brought to Paris by a British diplomat and introduced into the family of Louis-Philippe, where she was brought up with his children under the governance of Mme. de Genlis. However, many believed that the girl, now called Anne Caroline Stéphanie, was the daughter of Mme. de Genlis and the duke.3↤ 3. This and other facts about Pamela not related to Hayley and his circle are derived from Liam Chambers, “Fitzgerald, Pamela (1776?-1831),” Oxford Dictionary of National Biography, Jan. 2008 <http://www.oxforddnb.com/view/article/9580>, accessed 4 May 2009. See also Morchard Bishop, Blake’s Hayley: The Life, Works, and Friendships of William Hayley (London: Gollancz, 1951) 138, 143, 199. She was evidently a girl of beauty and charm, for Hayley singled her out in the “impromptu” he wrote before he and Romney left Paris: ↤ 4. William Hayley, The Life of George Romney, Esq. (London: T. Payne, 1809) 153. In 1791-92 Pamela and her tutor were in England, and Romney accompanied them to the theater many times. In January 1792 the artist began painting two portraits of Pamela. These were never finished, nor was a portrait of Mme. de Genlis begun at the same time.5↤ 5. Hayley, Life of Romney 169. Although it appears that Mme. de Genlis did not see Hayley during this visit, they were in correspondence, and she sent him a copy of her Leçons d’une gouvernante à ses élèves, ou Fragmens d’un journal, qui a été fait pour l’education des enfans de Monsieur d’Orléans (Paris, 1791), as Hayley tells his wife, Elizabeth, in a letter dates 19 October 1791.6↤ 6. Memoirs of the Life and Writings of William Hayley, Esq. the Friend and Biographer of Cowper ..., ed. John Johnson, 2 vols. (London: H. Colburn, 1823) 1: 419. Leçons was published in English as Lessons of a Governess to Her Pupils. Or, Journal of the Method Adopted by Madame de Sillery-Brulart, (Formerly Countess de Genlis) in the Education of the Children of M. d’Orleans .... Published by Herself. Translated from the French, 3 vols. (London: G. G. J. and J. Robinson, 1792). This book, Hayley says, “is a detail of all her minute attention to the children,” and Pamela plays a role in it, as do the other Orléans children. “She,” writes Hayley, “has just had the kindness to send me, with her new publication, a very pretty drawing from the pencil of Pamela, the lovely girl whom she educates with her princely disciples.” Although we cannot be sure that this was the “pastoral drawing,” it is Hayley’s only published mention of receiving a drawing by Pamela, who would shortly have little time for pastoral scenes. After returning to Paris in 1792, Pamela attended a performance of Cherubini’s opera, Lodoïska, and was seen in a loge by Lord Edward Fitzgerald, who was struck by her beauty. The resulting coup de foudre led to their marrying at Tournai on 27 December 1792, less than a month later. Lady Fitzgerald then went to live with her husband in County Kildare, and became deeply involved in his revolutionary activities. Just prior to the rising of the United Irishmen in 1798, Lord Edward, a leader of the movement, was wounded in a gunfight with the begin page 106 | ↑ back to top authorities and was left to die in prison without medical attention. The crown seized the Fitzgerald estates, and Pamela eventually returned to France, where she lived on a pension from the Orléans family. It must have been a small one, for she died destitute in 1831. From A Catalogue of an Interesting Assemblage of Pictures (1821); photocopy from the Frick Art Reference Library.